Is that a rainbow?? Nope, it's only carrots! Only carrots? Carrots are a great source of vitamin A and antioxidants so unleash the power of beautiful skin while eating something simply delicious. This is a really great simple side dish that would go great with any main course (particularly a nice roasted meat or a hearty pasta). Carrots are a refrigerator essential. They have a good shelf life and are relatively inexpensive. Sometimes carrots get a bad rap for not being the most flavorful vegetable, but I simply adore them. When you roast carrots, they take on a very sweet, caramelized flavor. I roasted different colored carrots for this dish. This is the perfect side dish because although the carrots would be great served hot, you can also enjoy them at room temperature or cold. So lets get cooking! Wash, trim and peel all of the carrots. Cut the carrots into similar sized matchsticks. Do this by cutting the carrots in half width wise and then half length wise (or so forth). 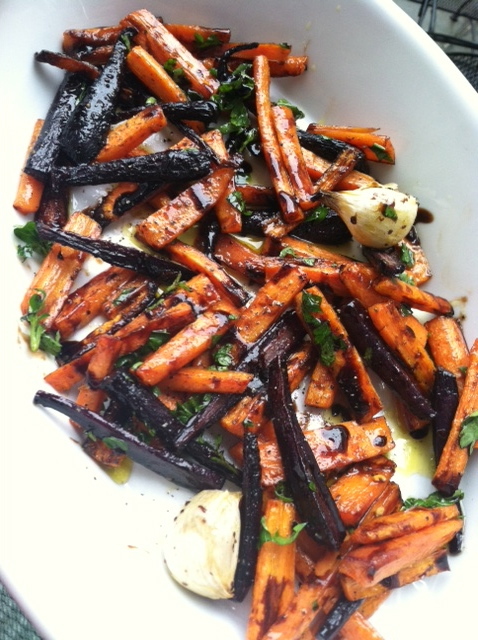 Toss the carrots in a roasting pan with the olive oil, garlic cloves, salt, black pepper and red pepper. Make sure that the carrots are spread out in one layer. Place the pan with the carrots in the oven. Roast for about 8-15 minutes or until the carrots are tender yet brown and caramelized. Take the pan out of the oven. 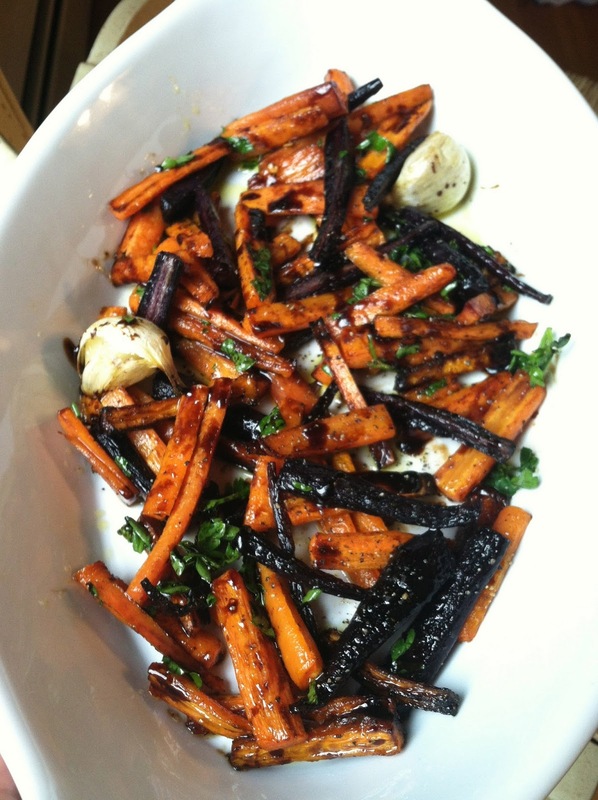 Top the carrots with the parsley, balsamic glaze and salt and pepper to taste. Put into a serving dish and enjoy! This entry was posted in Recipe,Sides by Catherine Amoriggi. Bookmark the permalink.